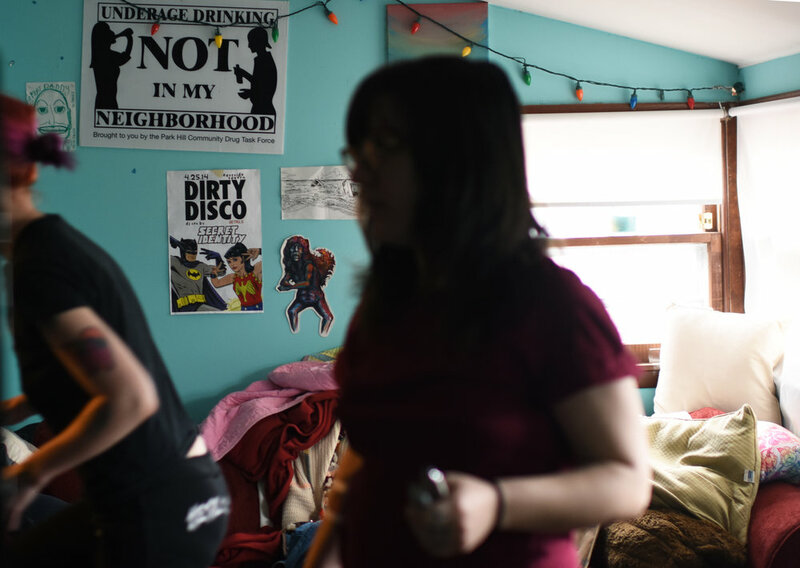 "I moved in here when I didn’t have a place to live and I was like, it would be really cool if this was a safe space where we had shows," said Alyssa Kelley who has lived in Gay House since 2012. Gay House is located in Columbia, MO. The small green house waves a gay pride flag off the front and is situated between three large fraternity houses. 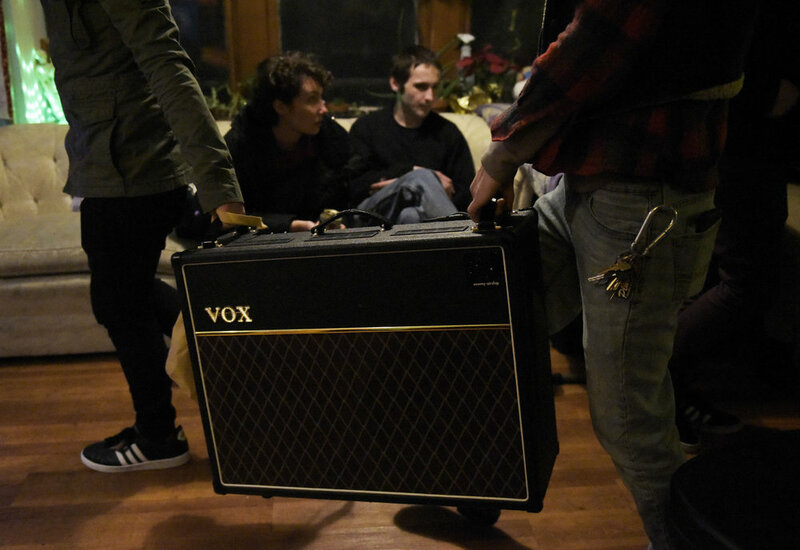 Out-of-town bands hear about Gay House and then reach out on Facebook to book a show. Alyssa said that Gay House is the only consistent house venue in Columbia. Although Alyssa has lived in the house for five years, the other residents of the house are always changing. “Everyone who moves in understands that it’s a safe space and that we have shows.” While hosting shows is great, ensuring a safe space is the most important. “If someone said to me, I’m not down with living in a safe space, then I would be like, well then you can move out,” Alyssa said. "But when it comes to having shows, every time we have a show, we ask permission from everyone in the house." If anyone wanted to stop having shows, then they would stop having shows. (From left) Alyssa, Briana, Zander and George enjoy a Thursday morning. Zander is a friend of Gay House residents and needed a place to stay before moving back to his hometown. 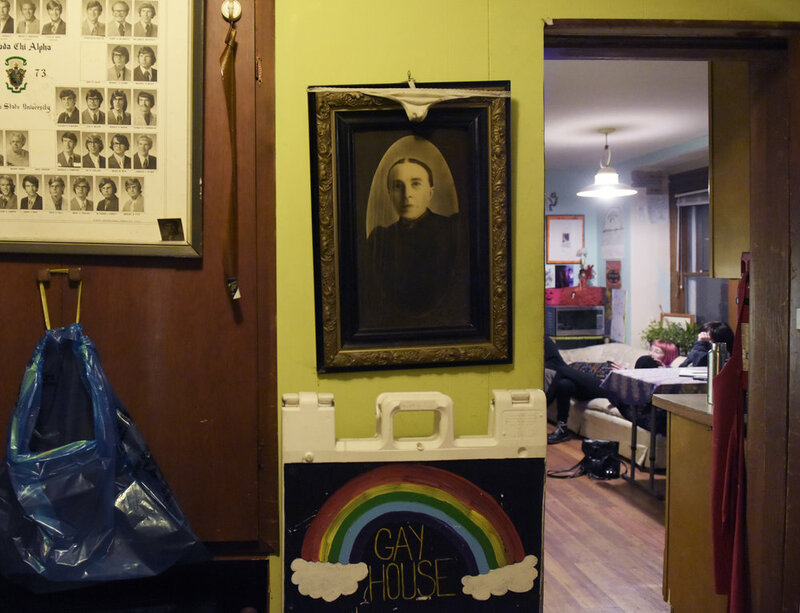 Alyssa describes Gay House as a 'safe space.' “For me, a safe space is a place where anyone can come and feel safe and comfortable. And if they are not feeling safe or comfortable, there is someone they can talk to make change.” Examples of that include asking someone to leave or confronting someone about certain behavior. Briana gives Alyssa a tattoo, which they named Loretta. Briana is an artist and recently began tattooing. This specific tattoo was designed by Briana herself. She will have her second art show on May 4 at Sager Braudis art gallery. Her art show is the same night as Gay House's next show. Gay House hosts around ten shows a year. They typically have one show every month, but sometimes they take a month off. On April 18, 2018, Gay House hosted bands North by North, Pink Fuzz and Gooey Louis and the Blues. Will of local Columbia band Gooey Louis and the Blues plays during a show at Gay House on April 18, 2018. Alyssa said that the local bands bring the crowd because people want to see their friends play. Drew screams during North by North's performance on April 18, 2018. This was North by North's second time playing at Gay House. (From left) Zander, George, Alyssa and Briana take a walk to check on a bat they notice on a nearby trail. They named the bat Wesley and called Animal Control to check on the bat. Unfortunately, Wesley had to be euthanized and tested for Rabies.